I don't ask anyone spend two hours on this, you get the idea after a while anyway. What's your take on thorium? Is this Kirk Sorensen on to something, or does he just have a big mouth? I am electric engineer, and my father used to work in nuclear industry back in the better days, so I have some knowledge about the topic. I got suspicious. Well, in general they speak a lot of interesting facts that will hurt modern "environmentalists" and this is a good thing. Trying to lift off at maximum influx of investments, aggressive campaign and just random set of scientific discoveries is a bad thing. Very bad thing, in fact. FFS, if everybody will think it's 100% safe and clean and profitable, there WILL be an accident to prove them wrong. Well, as long as it works, it works. I do not expect nuclear energy to replace fossil fuels in next 100 years - there's a lot things left to burn on Earth. I also do not expect thorium to be major contributor to this process - it is hard to expect a lot of outcome of such young idea. 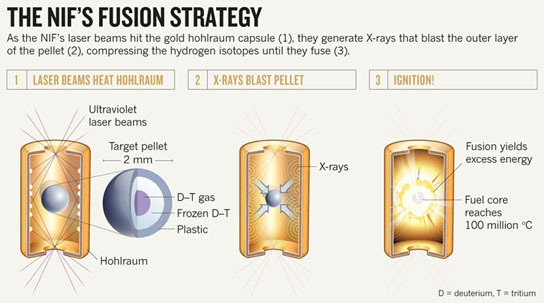 It will take over 10 years to just build and commercialize first thorium reactors in the case this really works. There are alternatives, of course, some of them more developed than others. I still wish that more people were chasing fusion power instead of going on about new and different ways to use fission, because fission in all forms can go real bad if a mistake is made, and there's always going to be the problem of waste, no matter how 'clean' a fission reactor is, waste will always be produced. Fusion on the other hand, can actually be made clean, even if the reactor goes critical and blows up all that happens is a slightly bigger boom and maybe a small puff of short-lived radiation, rather than a big boom and then an exclusion zone due to radiation. But I think where fusion reactors really come into play is the simple fact that it is relatively easy to get Deuterium and Tritium, heck, my water bottle probably has enough Deuterium in it to make at least a small explosion under the right circumstances. It's in all the water on earth. We just need to get it out. Tritium isn't actually too hard to do once you have deuterium either. So fuel is abundant, and the only waste product will be helium and a little neutron radiation (using Tritium) or perfectly safe Helium (using Deuterium) The only problem so far is heat, which isn't even nuclear physics, we just need better coolant. Along with fezes and bowties, brown dwarves are cool. Unfortunately it isn't as trivial of a problem as needing a better coolant. We need a method of actually delivering the heat to that coolant, without compromising the reaction. Fission reactors are fairly straightforward because the heat they produce is easy to convert into mechanical energy by pumping water/steam through the system, which is then used to spin a turbine. The heat from a fusion reaction on the other hand is much more contained. In confined plasma reactors like the classic Tokamak, you want absolutely no physical contact between the plasma and the sides of the vessel. The heat can therefore only be extracted by its thermal radiation. This is pretty slow, and we haven't figured out how to make it efficient enough to be worthwhile. There are other ways of doing fusion reactions, but they still invoke the same problem. It's (relatively) easy to make fusion happen. We know it works and have known it for decades, and nature figured it out long before us. But it is not easy to convert the energy output into useable work. Hopefully someone will come up with a very innovative solution. Considering the temperatures likely needed for fusion, I'm not sure it's actually safer than fission. If fission is possible with passive security, i.e. the reactions stops by themselves if something goes wrong, that seems worthwhile to pursue. 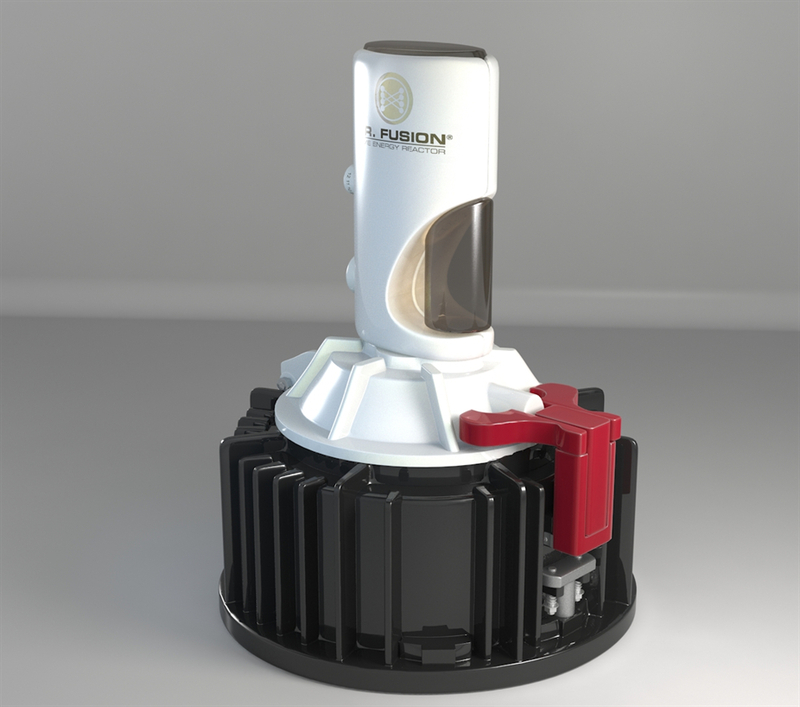 I'm not sure if anyone has come up with a design like that for fusion, apart from dubious cold fusion claims. I don't think that is possible. Considering what is needed to force nuclei together you are pretty much guaranteed to have high temperatures and so a complex reactor is going to be needed. The only gains I can see from using fusion is the energy output, but fission based reactors would always be a much safer investment option. I think however that inevitably if we survive long enough we will be forced to use fusion. For modern times I think adopting nuclear power worldwide alongside things like wind/solar/wave/geothermal would be the best solution. Fusion is far safer than fission, even in spite of the higher temperatures involved. Actually, in large part because of them. Fusion reactions require extremely precisely controlled conditions to occur, and they are not self sustaining (except in stars where gravity vs. hydrostatic equilibrium does the job). But here on Earth in any fusion reactor we've so far conceived of, it works out that if your control over the reaction fails, then the reaction simply quits. If the vessel fails, you may have an explosion, but the damage is highly localized, and it does not spread radioactive material. And you do not get a situation where a huge amount of material unexpectedly fuses all at once. The only practical way to turn it into a large explosion is by specially designing it for that purpose -- A.K.A. a thermonuclear bomb. Contrast this to fission reactions, which are very easily self sustaining, and do not require precise temperature/pressure conditions. The reaction rate only depends on how much fissile material you have in a given volume of space. The way you control the reaction then is by either moderating the position of the fissile material, or introducing some buffer/control rods between them to block some of the reactions. You also want a sufficient flow of coolant to bring away excess heat. Usually the reactor safety design is sufficiently clever that a failure of these systems will lead to the reaction winding down safely, but as we all know this is not always the case. With so much fissile material in close proximity, you can easily get a reaction that spirals out of control, overheating and essentially acting like a bomb. If the containment vessel fails in the ensuing explosion, significant amounts of radioactive material may spread over a large area. So yes, the high temperatures may make it tempting to think that fusion reactors are dangerous, but the problem isn't the temperature. It's what controls the reaction, and what happens if that control fails, that counts. The fact that the reaction requires such high temperature is actually a good thing. As for ways to get energy out of the reaction, radiated heat may be the only way, but since it has nowhere else to go except into the outer casing there is still a minimal enrgy loss, and it is actually useful that we use radiative heat instead of convection or something like that since the energy is relrased slower, it is easier to control, especially in a toroidal reactor. This means it is both easy and safe to run coolant/heat transfer liquid without the risk of it boiling in the tubes. The overheating problem I was referring to was that of the electromagnets, which have to take the brunt of the radiated heat. That's precisely right. And honestly with toroidal reactors you would want to use radiation as your initial heat transfer method. Conduction would just turn into vaporization. Convection is very challenging to model, and I'm dubious of its efficiency or even the possibility of designing a system around it. But thermal radiation is very simple, easy to model, and is ideal for when you have a super hot material surrounded by a containment vessel. But then it's a problem of efficiency since there's only so much flux you can put through it before the containment system suffers. In fission reactors you can get the heat transfer happening much closer to the reaction, without compromising the reaction. Also I didn't realize it was the electromagnets that are the weak point of the system, but that makes sense. Just wanted to share this picture while on the topic. 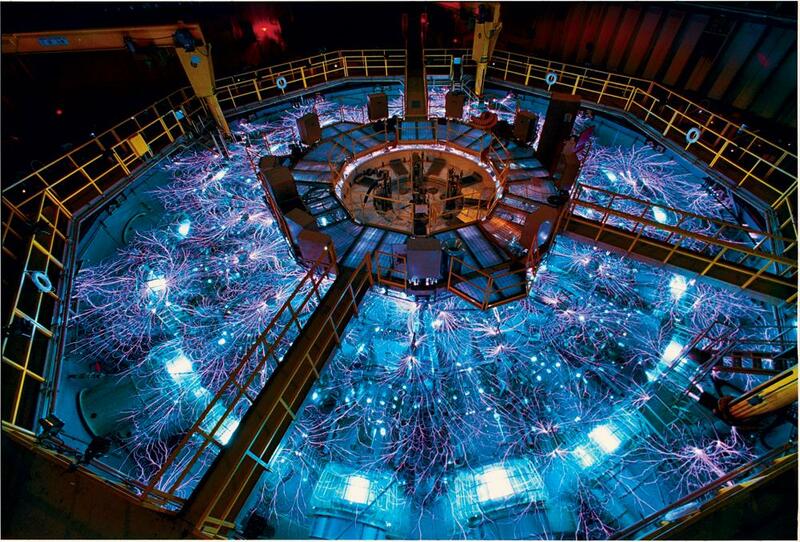 Not exactly a fusion reactor in itself, but an experimental facility back in the early days of fusion research, studying the extreme conditions involved. (Also largely for the more destructive applications.) It's the "Z Machine", and the electrical discharges produced when it was fired make one of the more impressive physics-themed photos I've seen. I did not mean safer in regards to radiation or danger. I meant safer as in terms of investments for energy production. We have the capability to build efficient and relatively cheap fission based reactors. Our fusion based capabilities are rather lacking and expensive, maybe in another 50 years. I am hopeful that workable fusion will be developed sooner, but I can't say I'm optimistic. but I can't say I'm optimistic. Until a more streamlined method of fueling is figured out I can't see fusion being used. Yeah, I don't really like pellet fusion either, maybe on small spaceships but that's about it. What I want are toroidal reactors, much more efficent and cheaper in the long run. Fusion also involves radiation, and as it functions, every part exposed to the core of the reactor will be irradiated as well. In particular, http://en.wikipedia.org/wiki/Neutron_radiation is a very strong factor. To put my view simply, humanity WILL go extinct very very soon. We won't escape that. That dosen't mean I'm pessimistic though, I'm just saying, do lots of everything, since everything will be dystopian soon. Just the natrual way of things I suposse. Semi-related to the Fermi Paradox if you can figure out how my view relates.